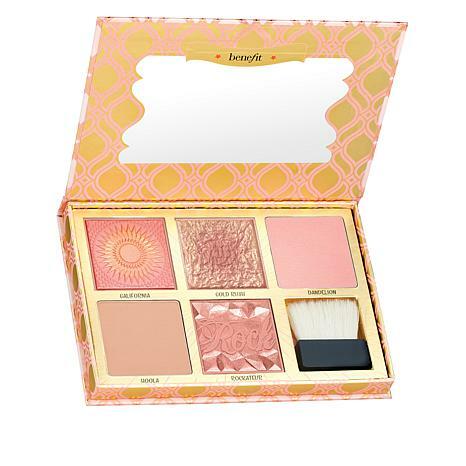 A cheeky bronzer and blush palette that helps get your cheeks "on pointe"! 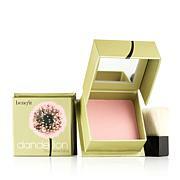 Mix and match blushes and bronzer to create a beautiful customized glow. Ingredients: Synthetic Fluorphlogopite, Mica, Cetearyl Ethylhexanoate, HDI/Trimethylol Hexyllactone Crosspolymer, Glycerin, Dicalcium Phosphate, Squalane, Octyldodecyl Stearoyl Stearate, Parfum (Fragrance), Caprylyl Glycol, Ethylhexylglycerin, Polysorbate 80, Limonene, 1,2-Hexanediol, Linalool, Hexyl Cinnamal, PTFE, Dimethicone, Benzyl Salicylate, Pentaerythrityl Tetra-Di-T-Butyl Hydroxyhydrocinnamate, Chondrus Crispus (Carrageenan), Xanthan Gum, Zinc Stearate, Silica, Lauroyl Lysine, Cetearyl Alcohol, Citral, Butylphenyl Methylpropional, Citronellol, Eugenol, Cinnamyl Alcohol, Geraniol, Tocopherol, BHT. [+/-: CI 15850 (Red 6, Red 7, Red 7 Lake), CI 15985 (Yellow 6, Yellow 6 Lake), CI 19140 (Yellow 5, Yellow 5 Lake), CI 42090 (Blue 1 Lake), CI 45410 (Red 27, Red 27 Lake, Red 28 Lake), CI 73360 (Red 30, Red 30 Lake), CI 77007 (Ultramarines), CI 77163 (Bismuth Oxychloride), CI 77288 (Chromium Oxide Greens), CI 77289 (Chromium Hydroxide Green), CI 77491, CI 77492, CI 77499 (Iron Oxides), CI 77510 (Ferric Ferrocyanide, Ferric Ammonium Ferrocyanide), CI 77742 (Manganese Violet), CI 77891 (Titanium Dioxide)]. This should last me awhile. I really loved the idea of having a selection of blush and this was a great way to get it. The range of colors will allow me to get the right combination that does not look overdone on my pale skin. I do not feel dressed if I do not have blush on. Very happy with this palette. Im using all the colors and they are just beautiful.This palette will last me a good long time.Great savings! Absolutely love this blush bar palette! the shades are amazing and I think this will work with light to medium skin tones. Now the 3 shiney pretty blushes don't stay looking like they do on the top, as soon as you use Galifornia, Rockateaur, and Gold Rush all the pretty comes off the top and they look plain underneath but still have a little shimmer. ROCKATEUR AND GALIFORNIA ARE THE BEST!!! I try to get this set everytime they release a new one. I love the colors and all I need is in one palette. It is slightly disappointing that this one and last year's are very similar so I wish they would make sure they were different. There are plenty of box o powders to make it different but since I love the blush and bronzer I still couldn't pass it by. It's also a good buy considering they are 29$ a piece.